This is a splendid and attractively-priced very collectible set of eight CDs with a 200-page hardback book, illustrating, celebrating and in many cases introducing (unfamiliar) music from the composers sometimes collectively known as the Fiamminghi (Flemish). The Flemish Polyphony from the Belgian label group, Ricercar-outhere, consists of ten and a half hours, 110 works, from the earlier phases of that remarkable flourishing of vocal/choral and instrumental solo and ensemble music from northern Europe. From the 15th century the music in many genres both sacred and secular (all of which are represented here) of Dufay, Ockeghem, Josquin, Pierre de La Rue, Obrecht and those whom they taught built a firm foundation for the Ars Perfecta in particular of the broader European Renaissance. The soloists and ensembles chosen for this anthology are just as varied, accomplished and stimulating. It's a gem of a set. You shouldn't doubt for one moment that it'll bring hours of delight. It will. Five distinguishable, though hardly distinct, "generations" of the Franco-Flemish/Netherlandish composers have been suggested: between 1420 and 1450 that of Dufay, Binchois and Antoine Busnois – the Burgundian School; from 1450 to 1485 chief amongst its figures were Ockeghem with Compère, Agricola and Tinctoris; between 1480 and 1520 came Obrecht, de La Rue, Isaac and most significantly Josquin; from 1520 to 1560 the fourth generation included Gombert, Crecquillon, Manchicourt, Willaert and Clemens non Papa; by the time of the notional fifth and last generation (1560 to 1620) many composers such as Lassus, de Monte and Vaet were actually working further afield (particularly in Italy) – what had begun in Burgundy had influenced and was accepted across the continent. These are hardly separate schools and are best understood as being defined as much as anything by the sequence of composers; although of course there was much musical advancement between the time of Dufay (who was born at the very end of the fourteenth century) and Josquin (who died in 1521)… pretty much the span of composers represented on these CDs if you don't count the plainchant and early anonymous examples. The music on the CDs appears roughly in chronological order: some of the CDs have multiple composers; others are more concentrated… CD 2, for example, is devoted to Dufay; CD 5 to Ockeghem; still others in the set are grouped according to style, influence and/or theme… CD 8 examines war and peace, for instance. This set is not a series of samplers, though; there are complete works and unified sequences. CD 6, for example, circles around delight in its many forms. Nor a random dip into the vaults of previously-recorded repertoire, although the works are all carefully culled from the Ricercar group's (and beyond) previously recorded catalog. While it makes no claim to be exhaustive or in any way complete, this collection is a superb anthology, a comprehensive survey, which achieves several important things. In the first place, the juxtaposition and sequence, the breadth and quality of the performances give a truly impressive insight into the work of the Franco-Flemish/Netherlandish composers. Like any good focused anthology, the whole is greater than the sum of its parts. After listening actively (either in sequence and/or selectively) to all 100+ complete works, one cannot but appreciate just how great was these composers' achievement. Then, one is struck by the variety of approach and execution of the dozen and a half or so composers represented here. Although the Italians linked them all using the name "I Fiamminghi" ("the Flemish"), their origins were from various states in the regions of northern France and what we now know as Belgium and the Low Countries. These CDs celebrate songs from the simple to the inventive, masses and other liturgical formats, the secular, the earthy and the sublime, pieces which are highly reflective and profound, the occasional work written for a specific and fleeting occasion, laudatory, satirical, laments, experiments, highly personal, social, purely instrumental, highly figurative and so on. That's a greater breadth than any one CD is likely to offer and substantially enhances our understanding of these composers' motivations and successes, innovations and influences. Thirdly, one is made aware of how composers both adapted existing forms such as the motet to the new Renaissance Humanism, to which it was well suited; and forged new modes of expression – again they did this with the motet in its own right. The sense of musical community, of a common purpose even, between practitioners is strong. Not only in the many teacher-pupil relationships and the use of common material; but also in what can clearly be seen as shared aims. Specifically, the adaptation of music to texts illustrates not only awareness of the poetic high-points represented by the likes of Petrarch and Boccaccio, but a full embrace of the advances for which they stood. The more ephemeral texts, the occasional songs, the shorter love songs too all get treatments appropriate to their gravity and appeal. Pronunciation is often French Latin. It is a pity that the texts of the works so carefully enunciated on the CDs are not made available as part of the lavish book that otherwise does such a good job of providing information to enhance our appreciation of the music. Essays on the composers are useful and clear, for instance. That Ricercar has chosen to use recordings by a total of 30 performers and groups can only add to our understanding of the variety of the works. Their approaches both inform one another and shine differing lights on the music. The standard, though, is high: you couldn't ask for more sensitive, subtle and perceptive singing than that from Cappella Pratensis in the Dufay mass, Sancti Jacobi [CD.2 tr.s 1-9]. The voices are light, translucent yet full of poignant emotion. The tempi are slow in order to achieve maximum respect for Saint James – though without idolizing him unduly: it's been suggested that Dufay's use of the word "bourdon" is a pun (on St. James' "staff" in the context of the composer's use of the technique of fauxbourdon. The singers have an ethereal and evocative vocal delivery in which, though, every syllable is clear and pointed. In common with most of the other such extended performances on these CDs, this is a thoroughly satisfying one. It's full of gentle grace and circumspection; yet has vigor and confidence. By contrast the lighter chansons by Dufay that follow on CD 2 are sung (by Continens Paradisi) in a manner that's lively without being jolly; with punch yet not superficially. Then on CD 4, for example, transparency is the most evident quality in Discantus' performance of a lovely selection of Binchois works. There is a careful clarity and precision to their singing that's matched by nicely-focused minimal instrumental additions. As a work like Ut queant laxis [CD.4 tr.3] progresses, you sense a real purpose in the singers' delivery of the text. It's not like the enunciation of a Lied with all the latter's turns of expression. But even the most remote sentiments, those expressed too in Romanesca's singing of the stylized love songs by Ockeghem on CD 5 [tr.s 1-7], for instance, are expressed by immediate, present, proximal singing; yet unpretentiously and very naturally. By the same token, for example, Vox Luminis misses nothing in somberness and sobriety, sadness and slow sorrow in the Ockeghem sequence [CD.4 tr.s 13-18]. When figurative singing that can make more of an appropriate impact by restraint is called for – in the much more public treatment of war and peace on CD 8 [tr.s 1-21], for example – Capilla Flamenca, Psallentes and Oltremontano all project grief, revulsion and jubilation in turn because they're present in the music, not merely because they know how to do so. In all cases across the eight CDs, that's just what's needed for this music. As you work your way through the music on these CDs you'll become aware of a strong sense of balance – between immediacy and making an impact on the one hand; and due deference to the global achievement of the Franco-Flemish/Netherlandish composers on the other. But there is no sense that the music has to be handled as fragile. It's living music. It breathes. Each performer and ensemble gives it the right breathing space. But each remains firmly in control throughout. Diabolus in Musica performs, for example, the Mass, Se la face ay pale [CD.3 tr.s 1-6], by Dufay with full attention to its long flowing lines. Yet without ever making the impact an impressionistic one: every syllable counts. In other words, this performance is typical of the approach taken by all of the performers of the choral polyphonic pieces: they're sung truly as choral works, not instrumental ones. No "wash" of sound. Such vocal groups as Diabolus in Musica, Capilla Flamenca, Ensemble Musica Nova and Vox Luminis have only six to eight singers. Of course we do not know whether these composers had large or small forces to draw upon. What can be said is that the gentle, unassuming and focused style of the performances gathered on these eight CDs is ultimately as communicative, beautiful and approachable as one could wish. It's not possible to generalize meaningfully about the quality of the acoustic in the many other CDs from which these performances have been taken – except to say that it is as high as one has come to expect from Ricercar; although perhaps a little too resonant and spacious in some places… a little too much echo in, say, the Missa "Verbum incarnatum" by Arnold De Lantins on CD 1, for instance. The book that is part of the presentation is glossy, substantial and very well-written and produced. Clearly-illustrated with many contemporary works of art and well-referenced, it contains essays on the wider background as well as full track listings; though nothing beyond the basic details of the performers, and no full texts. It might have been better to group all the material language by language (there are French, English, German and Dutch versions successively of each section), rather than alternate between them as section follows section. These are small points when set alongside the immense value, the uniformly high standard of performance and the overall impact that this anthology makes. Although most of these performances were released previously – on labels such as Ricercar, of course, and Æon, Alpha, Eufoda, Harmonia Mundi and Zig-Zag Territoires etc, they are by no means all still available. So the anthology with plenty of complete works represents a very useful re-release collection. 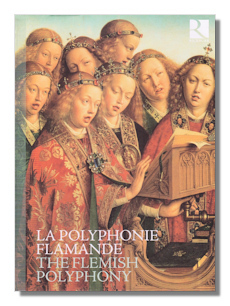 Whether or not you are familiar with the music from this period, whether or not you have representative collections from its composers, The Flemish Polyphony is definitely recommended.